1. Animals: Pets, birds, reptiles, amphibians, zoo animals, farm/domesticated animals, insects, etc. 2. Design Elements: Photos that emphasize line, shape, pattern, form, texture, perspective – can be any subject matter. Note: this is not a category for graphic illustrations made in a program like Adobe Illustrator, nor would extreme digital creations belong in this category. This is for line, shape, pattern, etc. 5. Nature & Landscapes: Landscapes, outdoor scenes, nature images, sunsets, urban landscapes, seascapes, cityscapes, farms, floral, etc. 7. Still Life: Arranged photos of diverse inanimate objects: food, plants, artifacts, etc. 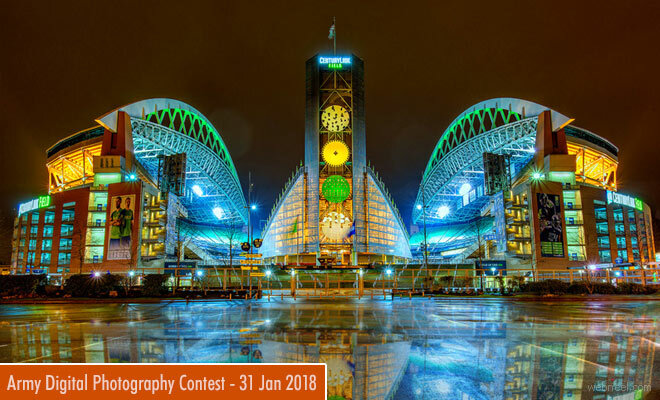 Participants must complete the online profile and submit photos between 12:00 am Central Time (CST) December 1, 2017 and 11:59 pm CST January 31, 2018 at contest website: https://cloud.mwr.army.mil/apptrac. Winners’ names will be posted on the armymwr.com website on or about March 15, 2018.